The old adage, “April showers bring May flowers” rings especially true in New England. While springtime is pleasant in the sense that the days are longer and plants are in full bloom, the region can also see its fair share of precipitation. The average New Englander can put up with a little rainfall here and there. It’s only when the area experiences above-average amounts of precipitation that things can start to take a turn — especially for homeowners. If your home and gutter system is properly built, rainfall should be lead away from the home. For homes that fall into the opposite category, rainstorms can create a world of problems. Properties with poor drainage are a significant threat to experience water damage during times of intense rainfall. Instead of your gutter system leading water away from your home’s foundation, the precipitation can find its way into your home, most frequently via the basement. Flooded basements are not only an issue due to the damage that can be caused, but also can be a recipe for mold and structural damage. Thus, it’s important for homeowners to act quickly in the event of a flooded basement. 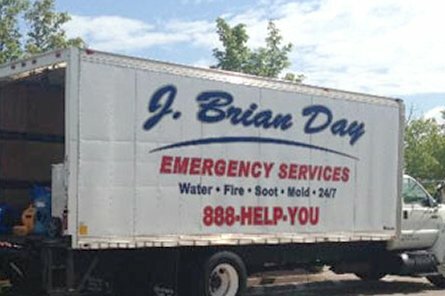 Instead of trying to remedy the situation themselves, homeowners should call the water damage experts at J. Brian Day for immediate assistance. One quick phone call will send a team of mitigation experts to your home. Our water damage removal and restoration team is well-experienced in quickly and efficiently resolving a water damage emergency. In the event that your home (or business) experiences a flooded basement, be sure to keep our phone number handy: 888-435-7968. We offer 24-hour emergency service and direct insurance billing for added convenience.